It has been 14 years since Southern Resident killer whales were listed as endangered under Canada's Species at Risk Act. Today, less than 85 of these whales remain. Despite their legal obligation to act, the federal government has failed to take measures to further recovery of the Southern Residents. As one of Canada's most endangered group of animals, actions for their survival cannot wait any longer. 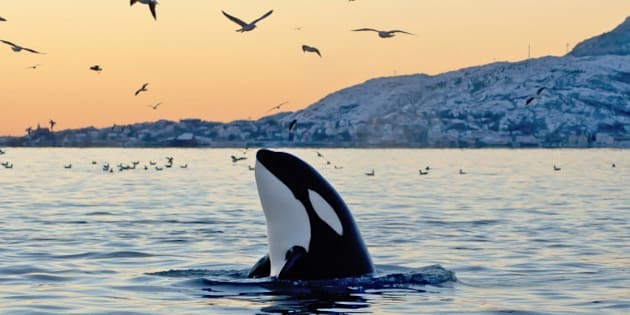 As top marine predators, the population status and physical condition of Southern Resident killer whales is emblematic of the overall health of the Salish Sea. As citizens of the Salish Sea, we know these whales represent much more. This irreplaceable killer whale population has significant and widely recognized social, cultural, and ecological values. A Population Viability Analysis (PVA) is a tool used by scientists to understand and rank threats to endangered species. It also provides direction on the most effective conservation actions to reverse their endangered status. Raincoast Conservation Foundation's PVA, conducted by leading scientists studying killer whales, acoustics and endangered populations, shows that Southern Resident killer whales require more Chinook salmon (their primary food source), and less noise and disturbance from vessels. The Raincoast PVA assessed the viability of the southern residents in light of their cumulative disturbances and threats, including increased ocean noise resulting from additional vessel traffic and oil spills. It also examined the role of Chinook salmon abundance and contaminants. The Southern Resident population has experienced almost no population growth over the past four decades, and has declined in the last two decades. Our analysis shows that increased traffic and noise conditions will intensify existing threats, accelerating their rate of decline and possibly leading to complete extinction. Conversely, reducing existing vessel noise and increasing Chinook availability increases their likelihood of long-term survival. "Low abundance of Chinook (Spring) salmon corresponds to killer whales not getting enough to eat, their survival and birth rates dropping, and mortality increasing. More Chinook for killer whales will require closures of commercial and recreational Chinook fisheries, and allowing these depleted salmon runs to rebuild," states Misty MacDuffee, a Raincoast biologist and director of the foundation's Wild Salmon Program. In addition to their diminishing food supply, vessel noise and disturbance make it difficult for killer whales to successfully hunt, feed and communicate. Southern Resident killer whales produce and listen to sounds in order to establish and maintain critical life functions: to navigate, find and select mates, maintain their social network, and locate and capture prey (especially Chinook salmon). The existing level of noise has already degraded critical habitat and studies suggest it has reduced the feeding efficiency of these whales. Until a Cumulative Effects Assessment is undertaken, no expansions in Salish Sea shipping should be approved or considered. Southern Resident killer whales are within 400 metres of a vessel most of the time during daylight hours from May to September. Reducing boat disturbance requires regulations that increase the approach distance from 100 meters to 200 meters, matching US regulations. Other disturbance initiatives, like limiting boat numbers, and/or constraining the viewing times and/or the days when boats follow whales, must also be considered. Such regulations also require enforcement. Raincoast's senior scientist Dr. Paul Paquet states, "This unique population of killer whales has continued to struggle while recovery actions have been delayed. In addition to addressing prey shortages and vessel disturbance, there is a clear need for longer-term action on marine pollutants, commitments to marine protected areas, amendments to marine mammal regulations, identification of Salish Sea killer whale sanctuaries, and reduction of ship noise." From commercial and recreational fisheries closures on Chinook salmon to whale watching regulations and enforcement, Raincoast scientists are calling for meaningful recovery actions for Southern Resident killer whales as they can only survive with strong protection measures and immediate action. A version of this article previously ran in Seaside Magazine.